Not completely accurate, but heck. Mark Twain expresses his views on the greed, ignorance, cruelty, but also the beauty and love in human nature in his book The Adventures of Huckleberry Finn by contrasting Huck and Jim’s peaceful river life with the hectic and sometimes dangerous adventures they had on land. Yeah, I'm definitely still hyper. wOOt. 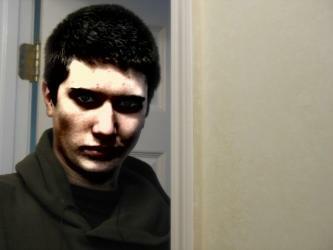 I took this picture a while ago, and sent it to Muse Magazine. Basically it was because I wanted to make sure they didn't leave my mail in the garbage. Hey, and I used middaymoon as my name, too. Ahahaha. I met this kid at Clemson this year named Patrick. He was freakishly tall and had large feet. Other than that, he was a really cool guy, and he hung out some. How are these stories related? Observe the comment on my myspace page, where the above picture was posted. It is from my good friend Patrick. "DUDE!!!! I cant believe that was you!!!! 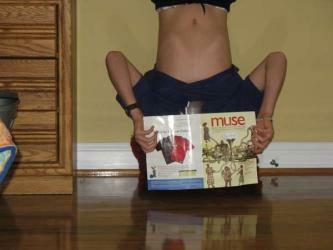 I get muse and I remember seeing that pic in the magazine and then trying to do what your doing... i think i fell?!? Anyway isnt it tweird that I would meet you later? It sure is a small world!" He didn't recognize me because my face was covered in the picture. How cool is it that he found it again, though? I would have pissed myself if I was in his position. Music was playing when I entered English class, and I broke it down. Kyle walked in a minute or so after me, and he broke it down, too. As of right now, my myspace profile says "I break into dance for no reason and when you least expect it. I want to work at Black20 offices. I would love it. Check out their new office.